Ghost towns! The very name evokes images of abandoned mining towns in the Old West, with dilapidated buildings lining the deserted Main Street, where once gun-slingers faced off and fought their battles. Classic ghost towns often exist in frontier or mining areas, but in fact they are everywhere; they abound in all states and all countries. You likely drive past them without realizing that something different once existed there. In a more general sense, we all live upon layers of civilization—that is why we have archaeologists. Defining the term “ghost town” is complicated. There are two major types: 1) the classic ghost towns which were simply abandoned and whose decaying sites you can visit, and 2) places whose original names are no longer in use—places renamed or merged with another city. As a collector, I like to gather objects marked with the names of ghost towns, and made when those places were still populated and active. What follows is a sampling of the variety of items that survive to document communities that have otherwise disappeared. Mining can be thirsty work, as this bottle from the Udell ghost town testifies. The Western United States is famous for its mines, but mines existed everywhere, including the coal mines in the Eastern part of the country. Many of these mining towns are now abandoned, such as Udell, Pennsylvania, from whence came this Byers Brothers bottle that once held beer or mineral water. Because it was not made in an automatic bottle-making machine, it likely dates from the 1890’s or possibly around the year 1900. 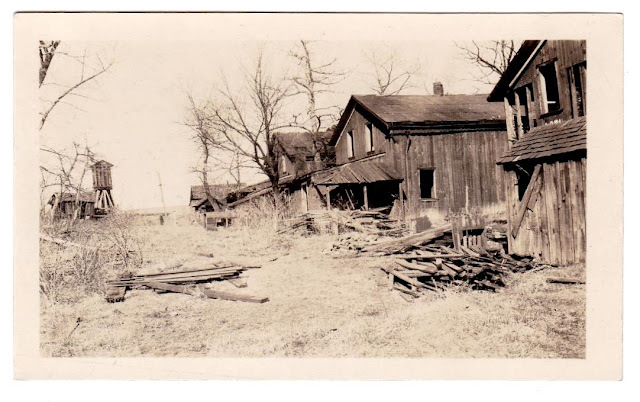 Many communities that became ghost towns were too small to manufacture goods with their names on them, but the pioneers were active letter writers, and early letters and documents are fertile areas to look for lost place names. 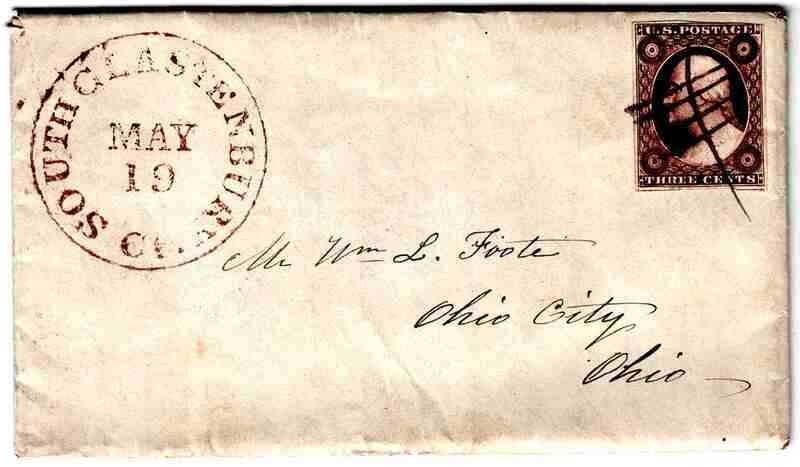 1846 letter with Ohio City postmark. 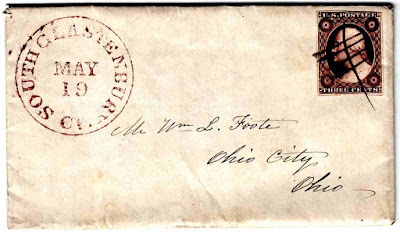 1852 letter mailed to Ohio City. 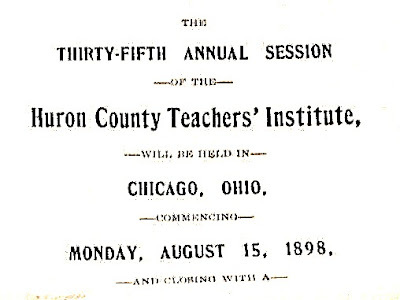 While the name of Ohio City may still be familiar, few have even heard of Charleston, Ohio, the original name of the city of Lorain, now a steel town to the west of Cleveland. Information is indeed scarce concerning early Charleston, a small boat-building center on the Black River in Lorain County. This Charleston document actually counts as a double-ghost town item, because Black River Township itself is now extinct, a process described in more detail below. In 1855, a suspension railway bridge was built across the Niagara River near the Falls, connecting the United States and Canada. On the U.S. side, the village of Suspension Bridge, New York quickly grew up, where in 1870 grocer Thomas Vedder made out this invoice. 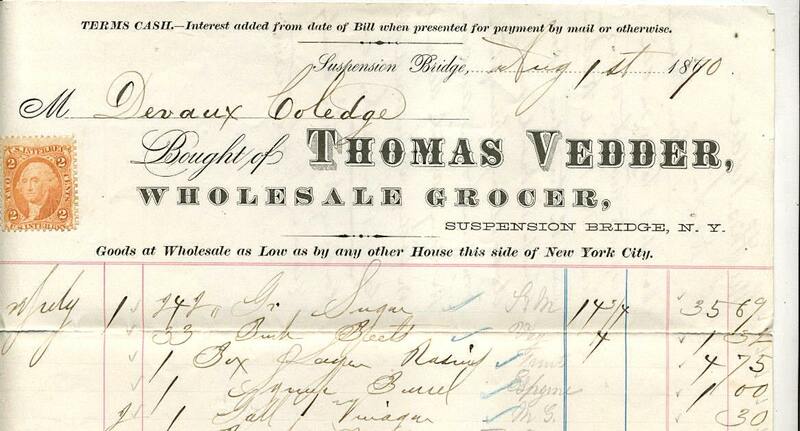 His handwriting is rather difficult, but I can spot sugar, beets, raisins, and vinegar among the line items. If blogger Mariette is reading this, please note the name of the grocer! Interestingly, the bill is made out to Devaux Coledge, which is actually Deveaux College, initially a charity and later a preparatory school near Niagara Falls, which only closed in 1972. Suspension Bridge the village ceased to exist when it merged into the U.S. city of Niagara Falls in 1892, and the bridge itself was torn down in 1897. 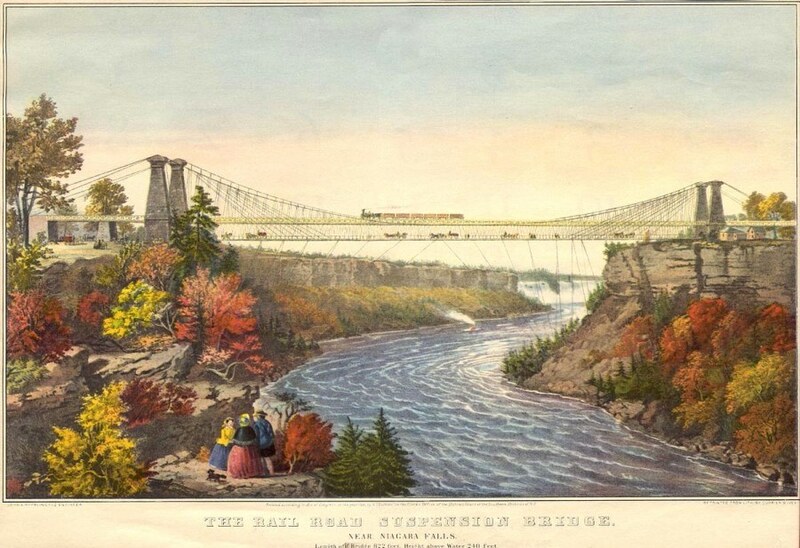 A lithographed view of the actual Suspension Bridge below Niagara Falls, courtesy of Wikipedia. While some localities take pride in their odd names, some former place names were discarded because of their meaning or peculiar sound. During World War I, many American places with German names renamed themselves out of patriotism. Among these was New Berlin, Ohio, home of the Hoover Vacuum Cleaner company. “Boss” Hoover himself was behind the movement to change the city name to North Canton, which officially took place in January, 1918. That is why this order confirmation from Hoover, dated March, 1918 is rather odd. 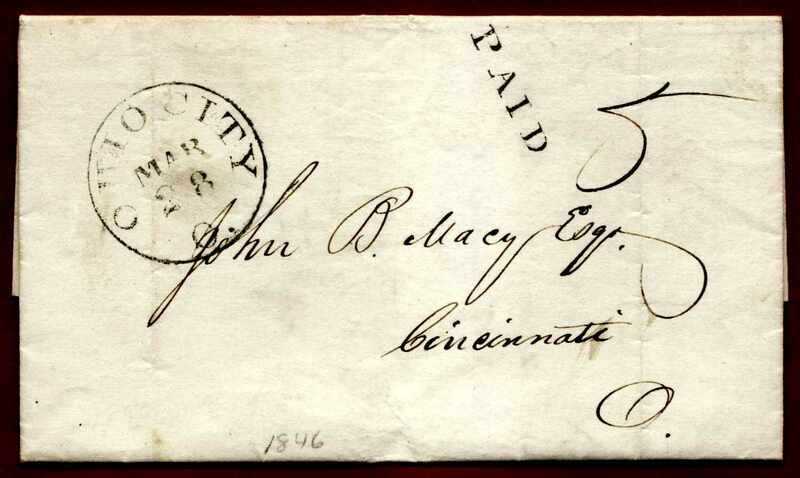 The New Berlin name is repeated five times on the form and envelope! The Hoover company might have wanted to use up its old stationery (although after all his bombast, Boss Hoover could have sprung for some fresh printing). Even the postmark is still New Berlin—how hard could it have been for the post office to order a new rubber stamp? 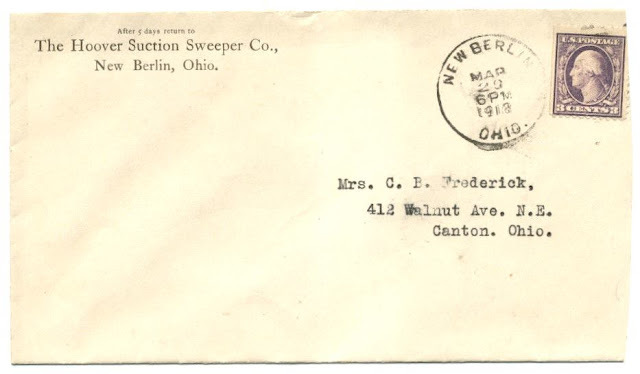 If New Berlin changed to North Canton in January 1918, why were the envelope and postmark still using the former name in March? I remember North Canton well, because when I was young we used to drive through North Canton and past the Hoover Factory when visiting my grandparents living in Canton, Ohio. 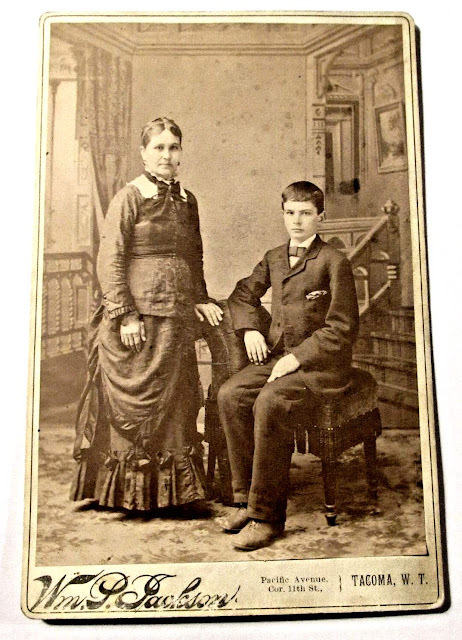 The classy-sounding Bluemont, Virginia only sprang into existence in 1900. Before that it was called Snickersville (and even earlier, Snickers’ Gap) after Edward Snickers, a ferry operator on the Shenandoah River. 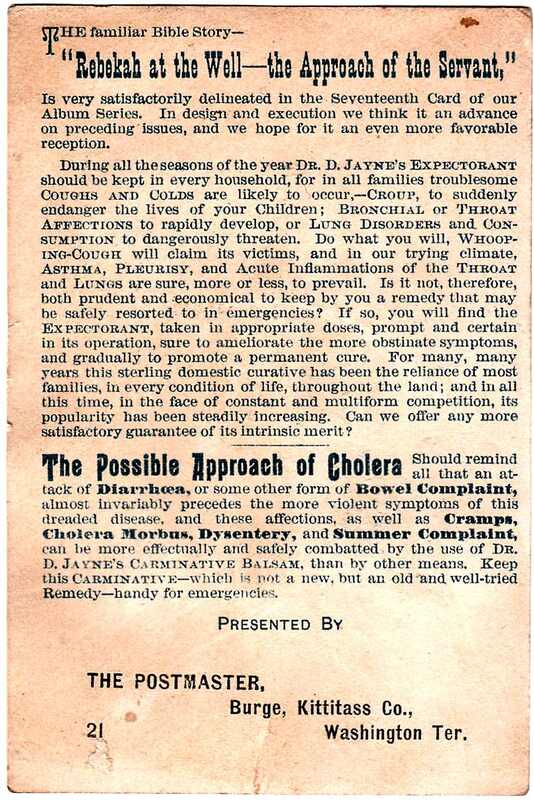 If Dr. Turner wanted to live in a tonier sounding city, he still had to wait ten more years when he wrote this letter in 1890. Snickersville was still a more memorable name than Bluemont! In the 19th century, as the population pushed west, the Postal Service was hard pressed to keep up with the new centers of population. Many branch offices in out-of-the-way locales later closed when area became a ghost town or the population shifted, and are now known as Discontinued Post Offices, or DPO’s. It is sometimes difficult to know the relationship between settlement names and post office names, and how one influenced the other. 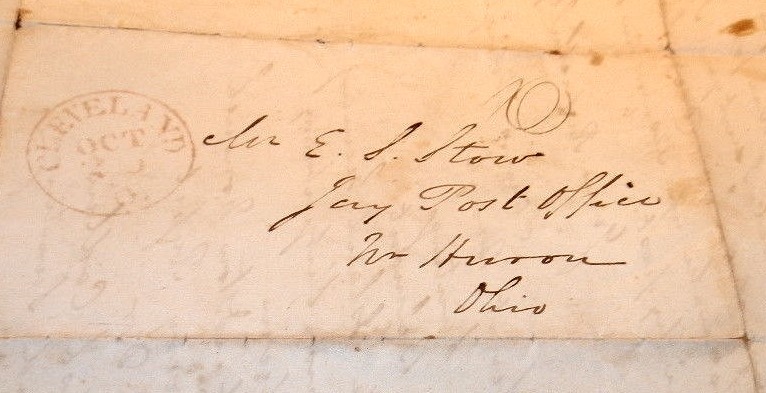 Here is an 1840 letter addressed from Cleveland to the defunct Jay Post Office near Huron in Erie County. 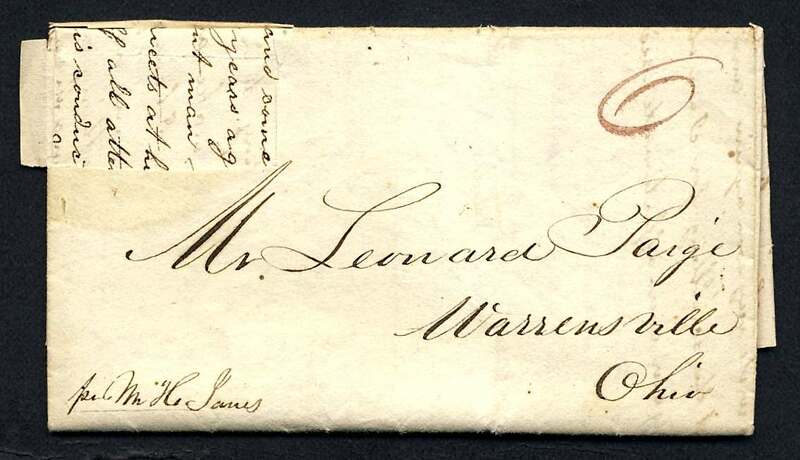 The letter inside is quite interesting, and will form the subject of a future post. It is difficult to research the Jay Post Office, but it was there in 1840 to receive this letter. 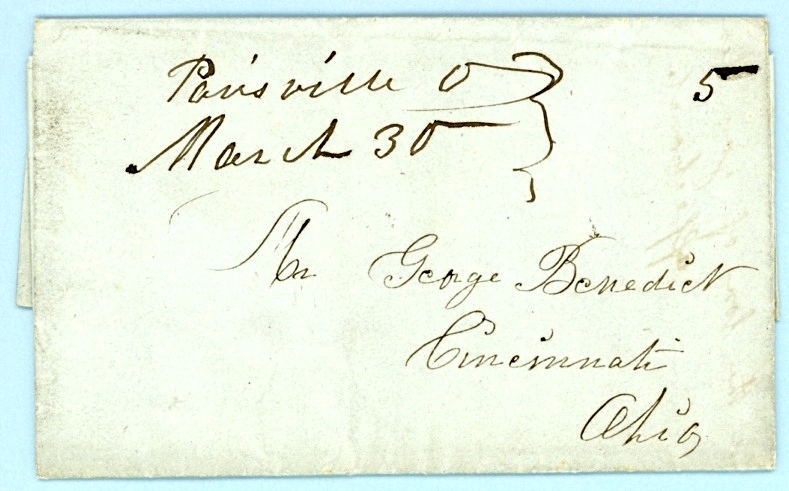 The post office at Parisville existed from 1827 to 1890, but in 1846 when this letter was mailed, it was apparently did not have a cancellation stamp, so a handwritten cancellation was used instead. Parisville Post Office served Paris Township in Portage County, but the township is pretty empty today. However, small places do not imply that little of interest happened there, and this letter is also worthy of a post on its own. In 1846, naming a wilderness town after glamorous Paris or Rome showed big dreaming. Now we come to perhaps the lowest level of ghost town, the extinct township. In Ohio and other places with the township system (every state has its own rules), the entire state is divided into counties, which are further subdivided into townships, which contain the land. If a community forms within the township, it can incorporate as a village, and later grow into a city. A township provides services and has officials, but after all of the land in a township in assimilated into villages and cities, the township becomes extinct and is said to be a Paper Township, and basically becomes just an historical place name without any real official meaning or duties. 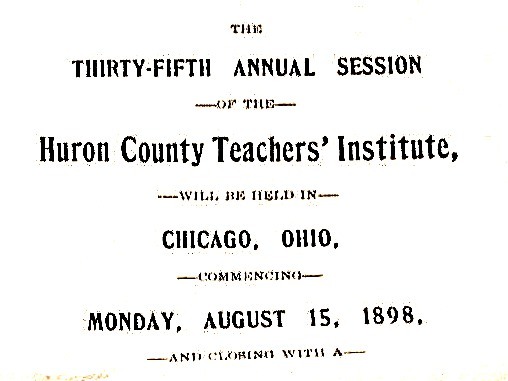 The Black River Township mentioned above is a paper township in Lorain County. Warrensville township was settled by Daniel Warren, son of Moses Warren who gave his name to the city of Warren in eastern Ohio. Another extinct township is Warrensville Township in Cuyahoga County. This township is of particular interest to me because that is the area where I was born and grew up, in the Village of Beachwood, which was incorporated in Warrensville Township in 1915. 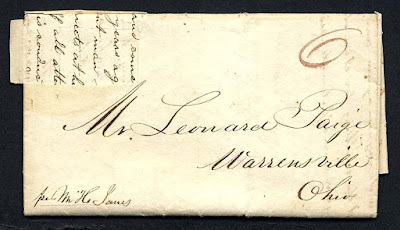 This somewhat earlier 1833 letter to Mr. Leonard Paige was simply addressed to Warrensville, Ohio, a rather large place, but sparsely settled at that time. The United States started out as the original thirteen colonies, and as the country gained land, the population moved west into what were officially territories that eventually would form one or more states. 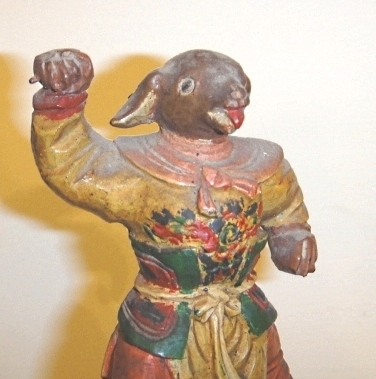 Items marked with the names of defunct territories are of interest. This 1882 letter from the town of Bridgewater hailed from Dakota Territory, or D.T. 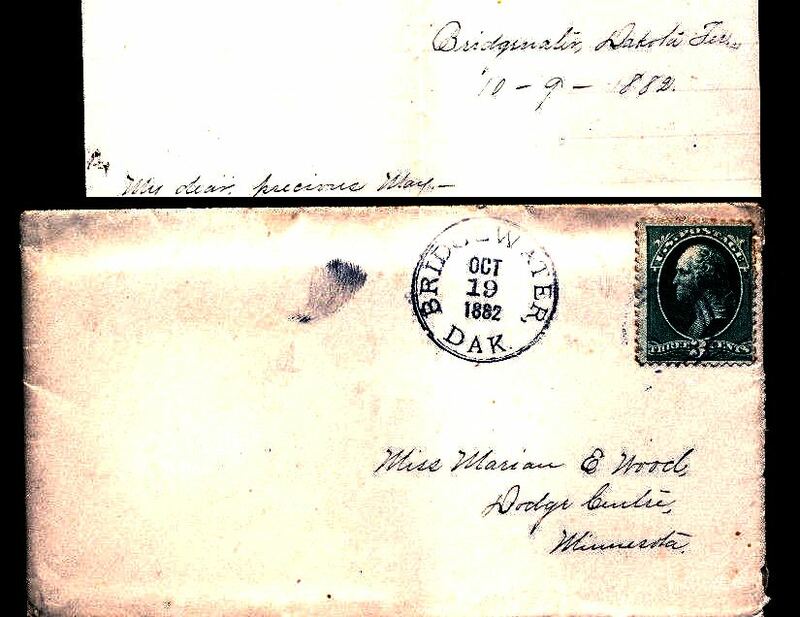 At the top of the letter it is spelled out Dakota Ter., but the postmark goes with a succinct DAK. No mention of North or South, but Bridgewater ended up in South Dakota, and is still located there. However, there is today no such place as Bridgewater, Dakota Territory. Although they may today be empty fields and woods, or submerged under a new name, ghost towns were real places, with normal people and business in them who left behind a paper trail which can still be followed today. Here is an unused check from 1880’s, printed by the Day Mining Company in the long-defunct mining town of Royal City, Nevada. Royal City is also a double-ghost town, because it was renamed Jackrabbit in the 1890’s, but even that was not a lucky charm; the town was eventually abandoned completely, and is now just a mass of collapsed buildings. The high hopes indicated by the regal name of Royal City did not pan out. Chicago, Ohio gave Chicago, Illinois some competition for a while. Some people today make it a hobby to visit and photograph the sites of ghost towns, but I prefer photos taken when the towns were still inhabited, or at least those taken shortly after the town’s demise. Washington Territory—the Pioneers evidently clung to the proprieties. Even in pioneer towns, daily life went on and kids had to go to school. Here is a photo of the schoolhouse in the now-ghost town of Edith, Texas. 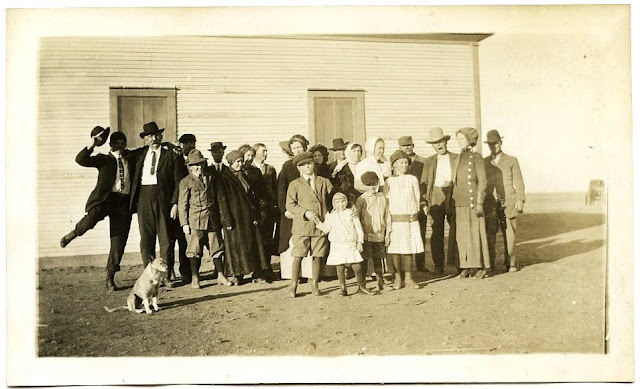 I like the variety of subtexts in this 1913 photo—the guy goofing off with his arm around the stern-looking old man, presumably his grandfather; the boy with a protective arm around his little sister, the man at the right who looks bored with it all, and the obedient dog who knows how to post for the photographer. Probably most of the former population of Edith, Texas turned out for this photo. Photographs are also good at revealing what we think of as the true derelict ghost town with decaying buildings. 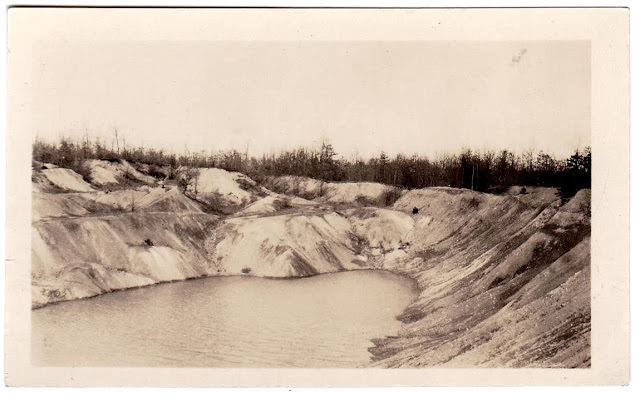 Take a look at these 1927 pictures of Scotia, Pennsylvania, a mining town that had obviously been abandoned some time ago, and with Pennsylvania’s winters, was probably not much longer for this world. Ruined houses in the abandoned town of Scotia, Pennsylvania. The old mill at Scotia. An ore pit at Scotia, the reason for the town’s existence. Many towns sprang into existence as mining or logging camps, lasting as long as the natural resources held out, and then quickly abandoned. 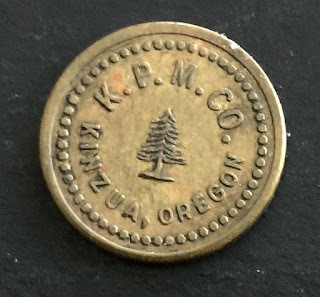 Often these companies paid the workers in scrip, a kind of token that was only redeemable at the Company Store of legend, so that the company further profited from its workers. Some of these scrip systems cheated the workers, but I have read that others were fair. I like the appropriate pine tree on this 5-cent token form the Kinzua Pine Mills. Pioneer territories, logging camps, and coal mines might give the impression that these ghost towns were rough-and-ready places, with little evidence of civilization. However, that was simply not the case, as letters, artifacts and memories amply show. 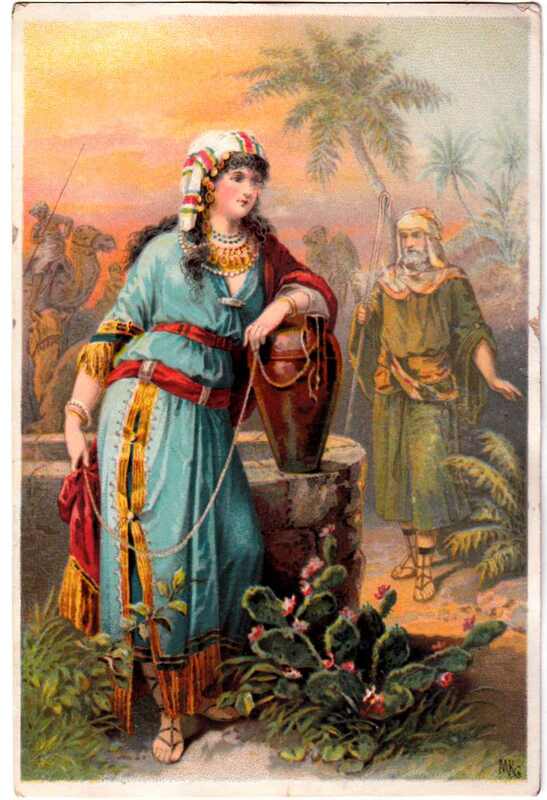 In the Victorian period it was popular for businesses, even those in the Wild West, to give out colorful lithographed trade cards, often later given to children and pasted into scrapbooks. The Winsor House hotel in Huron, D.T. 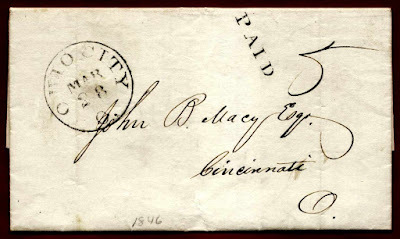 (Dakota Territory) gave away this humorous example. Huron, like Bridgewater above, later became part of South Dakota. The joke is explained in faint letters at the bottom: A Cold Water Man. 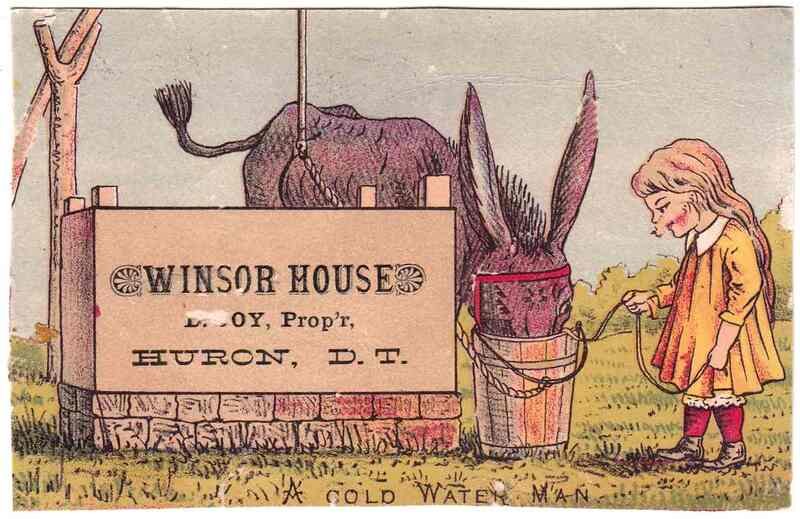 Some Victorian trade cards were fancier and better printed than the Winsor House one. Kittitass (now usually spelled Kittitas) County was the location of Burge. 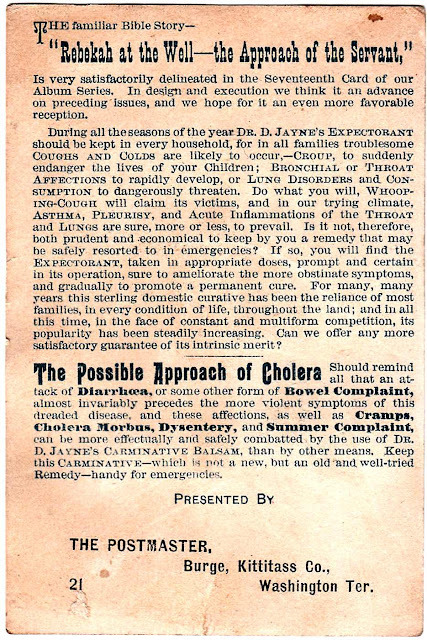 As printed at the bottom, this advertisement for Dr. Jayne’s Expectorant was given away by the postmaster at Burge, Kittitass County, Washington Territory. 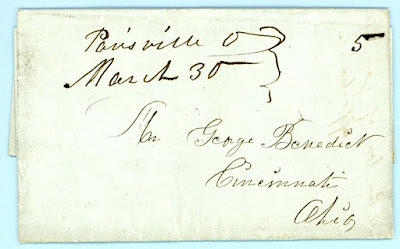 Apparently, Dr. Jayne's medicines were insufficient to save Burge, as research reveals that the post office at Burge was active only from 1883 to 1888, which fairly well dates the card, and that George W. Pressy was the postmaster referred to. The location of Burge within Washington Territory makes this yet another double-ghost town item. The ancient Egyptians believed that people and their souls were immortal as long as their names were repeated, and this appears to be true of places as well. Exciting novels and films give us one view of the stirring and sometimes lawless life in these forgotten towns, but actual artifacts give us a truer picture of how real people once congregated and lived their daily lives there, working and making plans for the future. The fact that people blazoned these objects with the name of their community means that those names will never entirely be forgotten. We all have a strong sense of place, and it is this that gives ruins and extinct towns their pathos and interest. 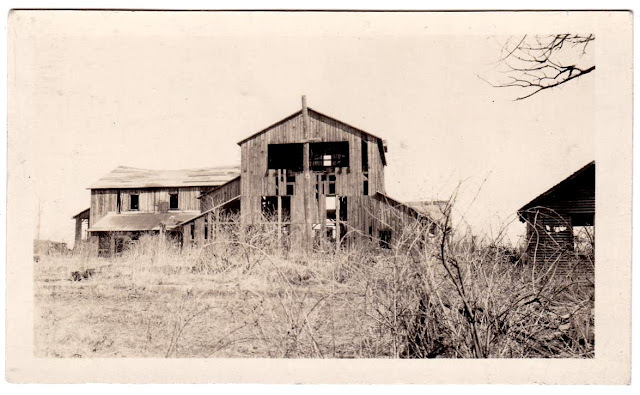 Have you ever visited a ghost town or heard of one in your area? No matter where you live, you are probably within a stone’s throw of a ghost town!